I have a 1963 C10 that I use as a shop truck/cruiser. I prefer these trucks lowered from their stock height. I'm taking a look at the front A-arm suspension and was hoping to drop the truck around 5" with modified springs. (Even at a 5" drop, these trucks still have several inches of ground clearance.) Typically lowering is done on C10's with a combination of springs and drop spindles, but the only dropped spindles are for disc brakes. So if you go the dropped spindle route you end up redoing your brake system (new lines, proportioning valve, disks, etc, etc). I have removed the springs up front with the truck on a lift and am running the suspension through its full range of motion. There are two issues I see when the suspension is sitting at a 5" drop. The lower ball joint is sitting at a pretty good angle (enough to concern me) and the tie rod ends are angled pretty steep as well. I might have a solution for the tie rod ends by repositioning them, but not sure if the lower ball joint is going to be a problem. I can't find any info on how much a ball joint can be angled for reliable service. Thought I would post this hoping someone has some ideas. I would prefer to get creative with lowering by the springs rather than going the full Monty with dropped spindles. The instant-center is going to be way below ground level and there's going to be wonky tire scrub on bump travel. 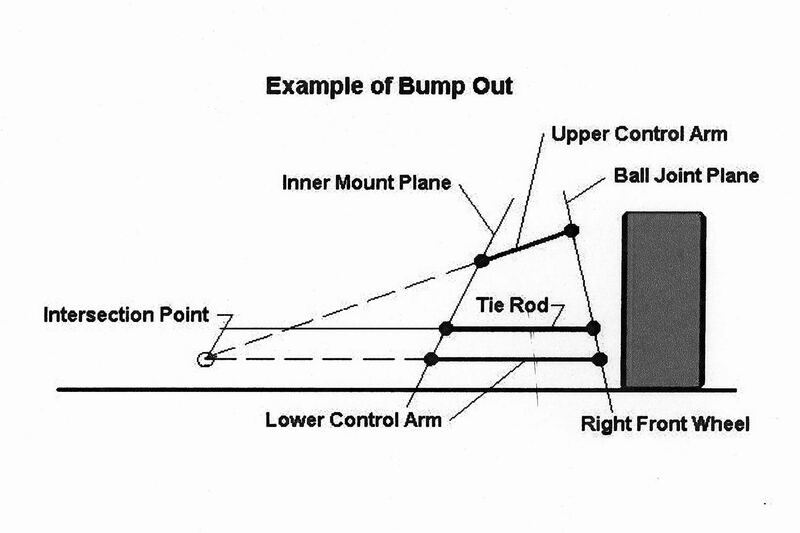 Arbitrarily relocating tie-rods is begging for bump steer, and bump steer is A Bad Thing. 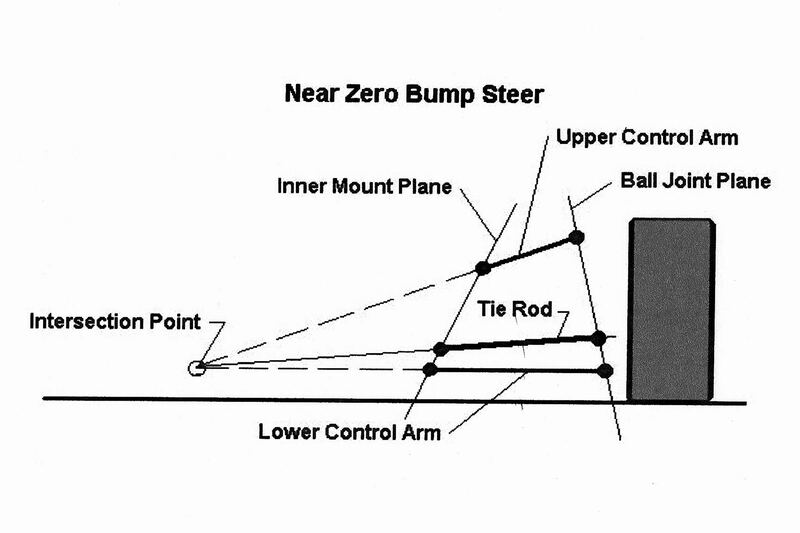 I have no experience with that particular chassis, but the above statement is generally true for any double-wishbone suspension design starting out with plausible roll-center heights and camber curves when at nominal ride height. If it has the coil-spring rear suspension, you're also going to find out that the panhard rod (which is too short!) will be significantly angled, which will lead to some wierd side-kicking and rear-axle-steering motions on bump travel. You will want to rework the mounting brackets so that the (new, longer) panhard rod goes all the way across the chassis (as long as you can get it) and is horizontal at your new nominal ride height. Last edited by Brian P on Wed Jan 03, 2018 8:26 pm, edited 1 time in total. IMO anything worth doing, is worth doing right; someone else has already done the design work. Iirc, it may not be much hassle to bolt the 71/72 [maybe all the way to '87] disc brake C-10 front crossmember to that frame, with the later ps box being a positive. Thanks guys. I am leaning towards biting the bullet and using drop spindles. I was just hoping someone may have fooled with these truck suspensions. I am not opposed to relocating arms, etc. But I'd need better knowledge on where to place IC's etc. I'm an engineer so I can do the calculations, I just wouldn't know what the desired results should be. I have done a pretty exhaustive look at what the aftermarket has to offer. They are not exactly confidence inspiring in how well their suspension packages are thought out. The best company I have found so far is Early Classic Enterprises. I have a 64 and was looking to do the same as you.HOWE makes racing balljionts that are rebuildable and you can purchase studs that are longer.A longer lower ball joint would lower the truck some. The ECE drop spindles are nice pieces...I have them on my '71. for you I think I would try to get a cradle/front assy from a wrecked or parted out 71-72 like Dave Brode mentioned. seems a decent budget way to do the front. if you drop the front too far, other things arise like tire clearance to the inner wheel tubs. Holy cow, there's some C10 guys on here!!!! I am now looking closely at drop spindles. The ECE spindles widen the track over an inch from a drum brake set-up. If you already have discs, the ECE spindles are not that big of a change in track width. The CPP drop spindles do not widen the track (either the modular or standard). Though the ECE guys seem to be much better to deal with for tech help. I think you are on your own with CPP. As I was looking at drop spindles I also realized that the other change I will need to make is to my wheels. The drop spindles may or may not allow me to use my stock 15" wheels. Every manufacturer has a caveat about this on their drop spindles. We need a drop spindle for drum brakes. RCJ: I saw the Howe ball joints, but I have no practical experience with using the longer studs. Is there a down side to the longer stud? People do make drop arms for the C10 where they raise the lower ball joint location point. This isn't super popular, because although it keeps your geometry, it decreases your ground clearance.....and its a lot of work. If I could gain 1 inch of drop from a ball joint, I think it is pretty reasonable to drop 3" with the springs. That would be a nice work around. I stuck with the springs only.I use Howe balljionts in my racecar ,they have always been very durable ,so I wasn't worried about the strength.I don't know how it would effect your bump steer,I never got that far in to it.You could do a search for Bob bolles bump steer image.It is an image that you draw a scale drawing of your a arm and tierods.Where the lines intersect will give you an ideal if it hurts or helps .